At Bicro, we depend on the sun and nature to grow our delicious ingredients. This is why we also consider it our priority to look for sustainable solutions for processing all these delicious natural raw materials. Today’s modern technology has made that possible. We’re proud to say we prepare all these delicious and healthy dishes for you in an energy-neutral fashion. Who knows, maybe you can even taste it! • We generate 100% of our energy consumption through our own solar panels, an impressive installation consisting of 420 solar panels with a combined peak power of 120 Kilowatt. This results in approximately 108 Megawatt’s on a yearly base. • Using LED and daylight in the kitchen and offices helps us save much electricity. • Overcapacity of our solar panels, used to preheat process water. • Residual heat from the flue gases, resulting in a 98% return on our gas. • Reuse of condensed steam. • All heat-carrying processes and transports are insulated. • Blanched meat and its broth, soups and sauces are hot-processed, prepared and sterilized immediately in one single production step, not wasting precious time, taste and temperature. • Cooling water is only cooled with outside air and largely at night, when temperatures are lower. • We only use biodegradable cleansing and disinfecting agents. • Any lubricants we use are non-toxic, edible and biodegradable. • We have reduced our water consumption by 60% through recycling of cooling water and strict water management. • We now recycle 80% of our tin packs. Also, they are 25% recycled steel. • We recycle plastic (33%), glass (92%) and cardboard packaging (95%). • We have completely separated our waste streams. Also, we make sure they are collected and processed in the following categories: organic, paper, wood, plastic and metal. Feel free to enjoy our cuisine without a care, knowing that Bicro works in a sustainable way and you still get great value for money. 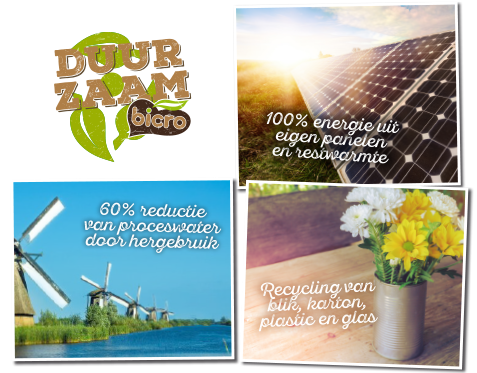 For being efficient, recycling and using solar energy not only makes our process sustainable. It als has financial benefits.